It's Juke Joint Boogie Time! 2012 marks the triumphant return of The Informants. The band took a much-needed break in 2011 and, in true Informants form, they still played some of their biggest shows in 2011, including playing before a sold-out crowd at the historic Red Rocks Amphitheater on May 31, 2011. Still, six years of constant playing, recording and constant hustle had taken a toll and the band needed to take some time away to rest, regroup and prepare for what will be the biggest year for The Informants. With a slimmed down lineup (sax ace Kenny Plum has been sidelined due to hearing issues) and a brand new batch of Mark Richardson's best songs yet, The Informants are poised to blow open the doors of what used to be considered "the blues." 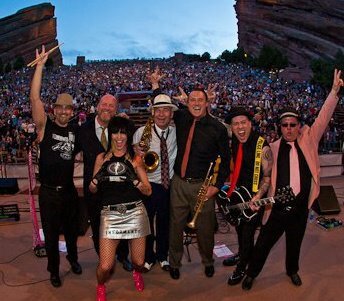 • The Informants now legendary live shows land them on Westword's "Best of 2008" as Denver's "Best Bar Band"
• Fans vote the band as the winner of the 2008, 2009 and 2010 Westword Music Award for "Best Blues"
• The follow-up CD, "Crime Scene Queen" is chosen from over 4000 CDs worldwide as the 2010 IBC "Best Self Produced CD"
The Informants are already taking 2012 by storm with headlining shows in major venues already booked, tour plans and the release of their as-yet-untitled third CD in the Spring. "Mark Richardson's songs come from a roadhouse somewhere in America -- one where Brian Setzer is playing just down the street and the Blasters are next door. Several strong rockabilly and blues tunes round out 'Crime Scene Queen.' Recommended." "A real treat for me on last weekend's Shipless Blues Cruise in Boulder was getting to see and sit in with Denver's The Informants. What an entertaining and exciting band. They won the Blues Foundation's Award at the IBC for best self-produced CD. They are a spectacular live band." "Masterfully blending with the satin and kick of instruments that waste not one note, [Kerry Pastine's voice] flows effortlessly across the 12 diamond-sharp tracks. Songwriter Mark Richardson is able to angle, crack and pop the songs in a way that suggests a renewal more than a retread." "This disc opens with a dense Peter Gunn-on-steroids riff and never lets up. The cooking Informants frame the switchblade vocals of Kerry Pastine on twelve original tracks destined for house rockin'. Big ups to producer Jeremy Lawton [of Big Head Todd & the Monsters fame] for keeping things ragged and right." - Westword's "Best Local Releases of 2009"
"With the release of [their second CD] 'Crime Scene Queen,' The Informants passed [the 'sophomore slump'] test and are showing that they are knocking at the door of national recognition...A lot of national blues bands would kill to have original songs of the quality displayed on 'Crime Scene Queen' and The Informants first CD, 'Stiletto Angel.'" "Perhaps it's the tracks featuring backing vocals that truly show off the group's versatility; its unexpected gospel singers on 'Salvation' and a hardy swing chorale on 'Get Twisted.' Their last album was praised by everyone from The Loveland Reporter-Herald to Westword, so consider the fact that their sophomore release is anything but a slump a sign that this is a group on the up." "On 'Crime Scene Queen' something new happens with the juke joint boogie. A major adrenaline boost happens on the title track and 'Don't Talk Betty' - with Paul Shellooe's blistering rockabilly guitar - already the justifies the purchase of this CD, it is swinging, abundantly rich with horns & guitars." "'Crime Scene Queen' is one of the best blues CD's of 2009. I can't wait to hear what they come up with next. But it will need to be over the top to sound as killer as this new release."